At least five starlings have become Extinct within historic times. The Rodriguez starling and Reunion starling, island endemics in the Mascarene Islands, may have disappeared in the eighteenth century. 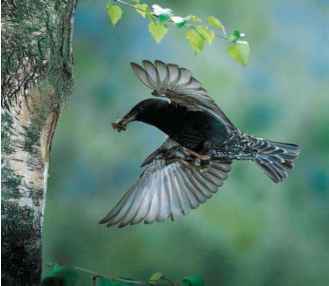 The Kosrae Mountain starling (Aplo-nis corvine), of Kosrae (Kusai) Island in the Caroline Islands, was first and last seen in 1828. The Norfolk Island starling (Aplonis fusca fusca) is believed to have disappeared in 1925, and its sister race, the Lord Howe Island starling (A. f. hul-liana), was last seen in 1919.
ically Endangered and may now be Extinct. The Bali myna is also Critically Endangered, suffering from capture for the cage-bird trade, with only 14 individuals known in the wild in 1998. The white-eyed starling (Aplonis brunneicapilla) of Papua New Guinea and the Solomon Islands is Endangered and suffers from taking of chicks for food, a practice aided by the colonial nesting of the species. The black-winged starling (Acridotheres melanopterus) of western Indonesia is also Endangered and suffering from the cage-bird trade. Vulnerable species include the Rarotonga starling (Aplo-nis cinerascens), atoll starling (Aplonis feadensis), mountain starling (Aplonis santovestris), Abbott's starling (Cinnyricinclus femoralis), and the white-faced starling (Sturnus albofrontatus). The Rarotonga starling from Rarotonga in the Cook Islands is rare and probably numbered fewer than 100 individuals in 1987. Classified Near Threatened are the Tanimbar starling (Aplonis crassa), yellow-eyed starling (Aplonis mystacea), rusty-winged starling (Aplonis zelandica), helmeted myna (Basilor-nis galeatus), Apo myna (Basilornis miranda), Sri Lanka myna (Gracula ptilogenys), copper-tailed glossy-starling (Lampro-tornis cupreocauda), and the bare-eyed myna (Streptocitta al-bertinae). The preponderance of starlings of the genus Aplonis on this list of threatened species is primarily a result of the diversity of this group and the cause of that diversity: isolation on small islands of the South Pacific and Indonesia. With limited habitat, bird populations are also limited. As human populations have grown on these islands, forest habitats have come under intense pressure. The colonial nature of many of the birds has also facilitated use of these birds as food or their capture for the cage-bird trade.